While 2017 was one of the safest years for police on record, police killings in the United States have become an epidemic with no signs of slowing down. However, there is another number that is particularly worrisome and it has to do with how many people American police have killed this year. As of the publishing of this article, the number of people who’ve been killed by police in 2017 is 1,184. This is nearly 100 times the number of people killed by terrorists inside the United States this year and yet the government and the media at large remain entirely silent on this violent epidemic. While the shootings in Nevada and Texas were horrific and some of the deadliest to take place on American soil, they are not technically classified as terrorism as they were not carried out in the name of a political ideology. Even if we include the deaths from these mass shootings, police have still killed far more people than all the mass shooters in 2017 combined. Our televisions and politicians constantly remind us of this essentially nonexistent terror threat while ignoring the very real threat from law enforcement. The victims of law enforcement are written off by society because their guilt is assumed and therefore they are dehumanized easily dismissed. However, not a single one of these 1,184 people who were killed by police in 2017 had a chance to be proven guilty. What’s more, many of these victims were unarmed and innocent—some of them were even innocent children. When the ostensible protectors of our even more ostensible freedoms are nearly 100 times more deadly than the people we are told “hate our freedoms,” something is definitely wrong. Why is it that cops in America kill more people than any other civilized country? Do we have a higher crime rate? The short answer is no. If we look at our neighbors across the pond in the United Kingdom, their total crimes per 1,000 citizens is 109.96. This is a whopping three times more than the United States whose total crimes per 1,000 is only 41.29. However, police in England have only killed a total of 4 people in 2017. Cops in America have killed close to 300 times more than them. If this doesn’t say, ‘hey we have a problem,’ what does? With only a few hours left in 2017, American cops have broken last year’s record of killings and show no signs of slowing down. But America has a much larger population than England and therefore these numbers don’t equate, right? Wrong. China, whose population is 4 and 1/2 times the size of the United States, hasn’t recorded a single killing by law enforcement officers in all of 2017. In fact, more people were killed by American police in just the last four days than were killed in 2017 in Germany, England, Spain, Switzerland, and Iceland — combined. If we look at the total for the year, American cops have killed more people in 2017 than the above countries have killed in decades. It is also important to point out that US citizens aren’t attacking cops either as 2017 was one of the safest years for police officers in the last five decades. So why are police in America far deadlier than the rest of the world? Police killings go unpunished because initial investigations are usually conducted by the police department where the alleged perpetrator works, because prosecutors have wide discretion over presenting charges, and because the use of force is not subject to international standards, according to a report out of Reuters. Aside from the lack of punishment, the job description of a cop has changed drastically following the onset of the drug war. 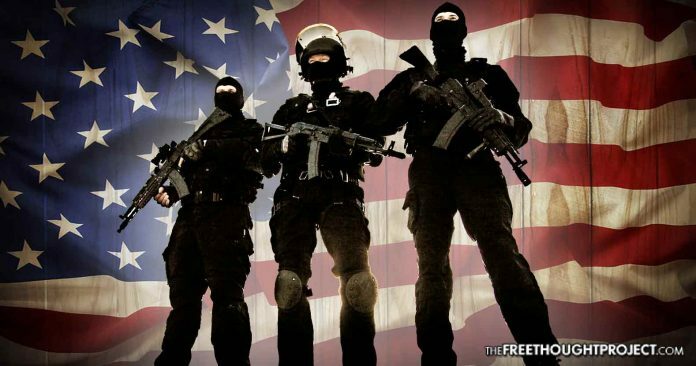 Police have morphed into a standing army using the same weaponry and tactical gear that can be found on the battlefield in one of the many countries occupied by the United States military. They are actively engaging otherwise entirely innocent and peaceful citizens in this war on drugs which makes the people the enemy. The overwhelming majority of police brutality cases stem from the war on drugs. When so many people are tasked with finding and prosecuting those in possession of a substance deemed illegal by the state, the interactions become more frequent and less cordial. If we end that, we get the state out of the private lives of most individuals. This will only serve to lessen the scope of police harassment, in turn lessening the instance of brutality and killings. Criminal gangs form to protect sales territory and supply lines. They then monopolize the control of the constant demand. Their entire operation is dependent upon police arresting people for drugs as it creates a monopoly on distribution for those willing to break the law. However, the illegality of drug possession and use is what keeps the low-level users and dealers in and out of the court systems—feeding the prison-industrial complex while fostering the police state. When drugs are legalized, gang violence drops — drastically. Not only does it have a huge effect on the localized gangs in America, but the legalization of drugs is crippling to the violent foreign drug cartels too. This is the reason Norway just moved to decriminalize all drugs. We will see more senseless killings and more innocent lives stripped of opportunity by getting entangled in the system. It is high time we #End the Drug War and retrain police to see the American public as a friend—and not an enemy.